The FlexRenko ChartStyle developed by user dansmo is a chart style which is similar to the usual Renko style but the calculation of the brick size can be switched from a fixed value to a volatility adjusted method using the ATR(14). Right-click the chart and select "Chart Style Settings" - or simply hit Ctrl-Y on your keyboard - to invoke the dialog where you can set which method to use and which factor to take for calculation of the brick size. As of version 2010.12 of the library, FlexRenko uses the 14-day ATR as a basis for the calculation of the brick size on intraday charts. (Previously, the ChartStyle used the intraday ATR, making the chart to depend heavily on recent intraday volatility.) The change is designed to keep the brick size constant during the trading session and make the chart's look & feel resemble the traditional Renko chart. 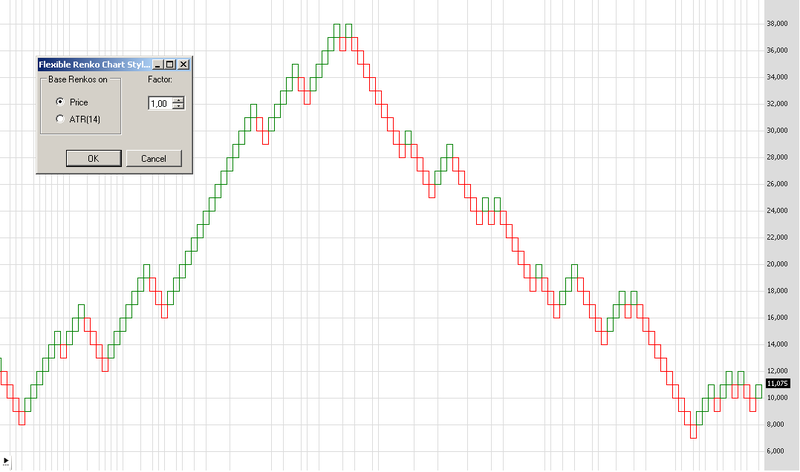 Note: for an intraday chart to start drawing FlexRenko bricks, the equivalent of at least 15 Daily bars must be loaded; otherwise you'll see an empty chart. 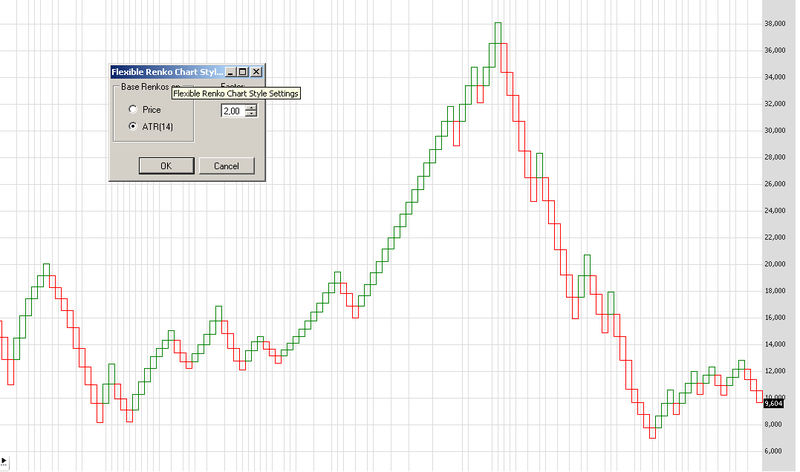 Example with FlexRenko using Price based calculation of 1,0 Dollars. Example with FlexRenko using ATR based calculation where ATR is weighted with a factor of 2,00. You can call the FlexRenko method and use it in a bar chart to get all the necessary information. Here´s an example that will paint the bar chart red/green if there are up/down bricks.